Off late I have been getting millions of tips and recipes from all my relatives and friends. Though I have been trying everything I just could not post any on my blog. I have a huge backlog and really want to keep a track of these wonderful recipes. So, for the next few days you will see new posts everyday ! This is a very easy recipe and I sure wanted to prepare this with pongal. I bought cut yams from frozen section. I do see fresh yams every week in both Indian stores and Ranch Markets, however I dont get the taste of those fresh yams which I used to have in Thirthahalli, my hometown. Heat 4 table spoons of oil in a skillet and fry yam pieces on simmer.Fry this until yam turns dark brown. This will take around 15-20 minutes. Make a smooth mixture of grated coconut, red chillies and tamarind extract. Drain excess oil and pour fried yam pieces into this paste. Prepare seasoning with remaining one table spoon oil, mustard seeds and curry leaves. Pour this into sauted yam and coconut mixture. Add salt and mix it well. Serve with rice or pongal. Note: The coconut mixture should not be heated. Just mix the yam into coconut paste and mix it well. This recipe is very much like kirla sanna polo. In fact it is the same recipe, the only difference is here we make small balls out of the batter and deep fry it. However I posted this in a separate post as I wanted to neatly jot down everything I have tried and learnt from different people I have come across. Drain the water from rice and grind it with grated coconut, red chillies and tamarind extract into a smooth paste. Chop bamboo shoot. Mix these pieces into the above paste and add salt. Make small balls of this batter. Heat oil in a pan and deep fry these balls. Serve it as a side dish with rice and dal. Note: I always soak bamboo shoot in plain water for 2 days before using it. Change the water once in a day. Sanna polo is a dosa which is served during lunch. Sanna polo can be prepared even with cabbage and onion. This is a very tasty dish and both of us just love it. My aunt used to prepare this very often and my husband became an instant fan of kirla sanna polo. Spread this on a hot tava. This paste should be thick and should be spread by hand. My husband's all time favorite. Most of the time he prepares this upkari at our home and I must say he is a good cook, probably better than me :). I am not a potato lover but like this simple fry with dalitoy and rice. Easy to prepare and tasty to eat. Cut potatoes into desired shapes, sprinkle salt and leave it for 30 mins. Heat oil in a pan and add mustard seeds, curry leaves, red chillies. When it starts spluttering add potatoes. Drain the salty water from potatoes before adding it. Keep frying this on simmer until potatoes are cooked. Note: While frying add salt only if required. 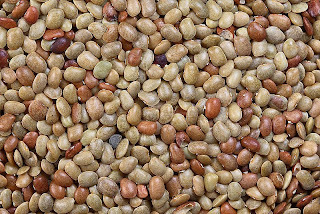 Horse Gram is also known as Moth Beans and it is used as daal or lenthils. I remember my granny used whole seeds of horse gram to feed cattle. She also used to prepare soup which can be served with rice. I will be posting it once I try it out. Pressure cook bamboo shoot and horse gram upto 5 whistles. Make a paste of grated coconut, red chillies and tamarind extract. Mix the mixture with cooked horse gram, bamboo shoot, salt and boil it for 8-10 mins. In a small pan heat oil and fry the garlic for sometime. Pour this on the curry. Note: Horse gram takes longer time to cook compared to other daal or lenthils. 5 whistles or more is a must.